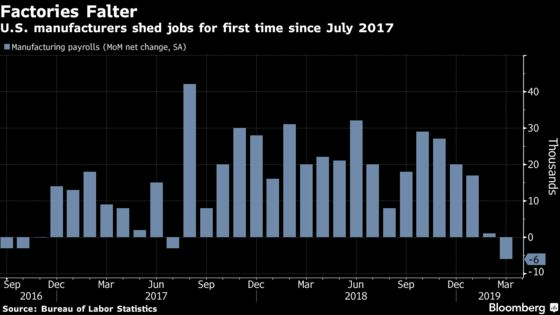 (Bloomberg) -- U.S. hiring rebounded more than forecast in March and the prior month was stronger than first reported, potentially relieving some concerns about a cooling economy. Wage gains eased and the unemployment rate held near a 49-year low. Payrolls rose 196,000 after a 33,000 advance, a Labor Department report showed Friday. The median estimate in a Bloomberg survey saw an increase of 177,000 after an initially reported 20,000 gain in February. Treasury yields pared their gains briefly, but recovered to pre-report levels. U.S. stock futures advanced. The jobless rate was unchanged at 3.8 percent, while average hourly earnings increased 3.2 percent from the prior year, below all estimates and down from the best pace of the expansion. The data signal the labor market is solid enough to support economic growth in coming months even if job gains are moderating from last year’s pace. 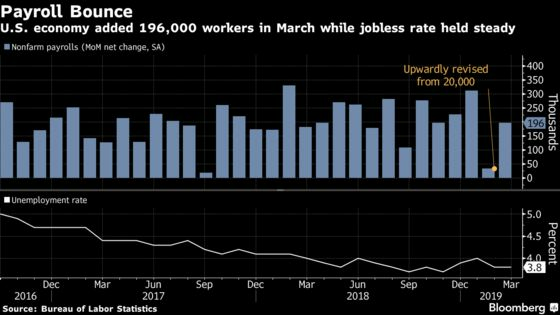 Unemployment near historic lows bodes well for consumer spending, though weaker wage gains suggest inflation will be even more muted as Fed policy makers wait to see how the U.S. economy weathers a global slowdown. The data come as investors expect an interest-rate cut this year after four hikes in 2018. The Fed early in 2019 removed projections for rate rises in the near term while flagging increasing economic risks amid slowing global growth. Payroll gains were led by education and health services as well as professional and business services. Construction payrolls rebounded with a 16,000 gain while manufacturing continued to weaken with a loss of 6,000 jobs, the first decline since mid-2017. Other data had earlier shown a mixed picture for factory employment. The participation rate, or share of working-age people in the labor force, decreased to 63 percent from 63.2 percent the prior month. The rate, which faces continued downward pressure as older workers retire, had ticked up in recent months as increased employer demand has pulled in more Americans. Combined revisions for January and February added 14,000 more jobs than previously reported, though the three-month average decreased to 180,000 from 191,000. Average hourly earnings rose 0.1 percent from the prior month, missing estimates, following a 0.4 percent gain. A longer workweek may also have had an impact on wages: The average for all private employees increased to 34.5 hours from 34.4 hours. A longer workweek tends to reduce average hourly pay. The U-6, or underemployment rate, held at 7.3 percent; the gauge includes part-time workers who’d prefer a full-time position and people who want a job but aren’t actively looking. Private employment also rebounded to show a 182,000 gain after an upwardly revised 28,000 increase; government payrolls expanded by 14,000.